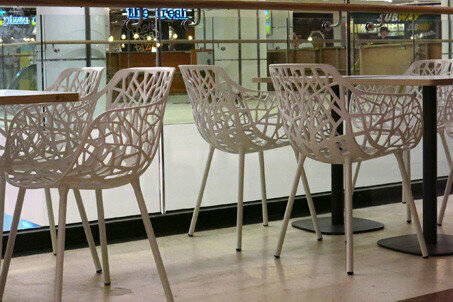 One of our recent shopping centre food court projects is the Victoria shopping centre in Londons Victoria train station. As part of Victoria Place Shopping Centres remodelling works, Working Environments worked alongside Haskoll architects to help specifiy and supply the central foodcourt loose furniture package. The Catifa 44 chair in a range of two tone finishes, sits alongside the Forest armchair. These are accompanied by a the Circ table with a gun metal steel base and white laminate top with ply edging.